When families elect to place their elderly loved ones in the care of medical professionals at a nursing home facility, they are putting their trust in the hands of the caretakers, doctors, and staff at the facility. Unfortunately, elder abuse is far more common nationwide than most Americans would like to assume. According to the National Council on Aging (NCOA), as many as five million elderly Americans face some form of abuse each year. The NCOA defines elder abuse as any form of physical, emotional, or sexual abuse inflicted upon an older adult. Elder abuse continues to be a problem throughout the United States, in large part due to the fact that many of the cases go unnoticed by family members and are never taken to the proper authorities. In fact, one study estimated that less than 10% of all nursing home abuse cases are reported to police. If a member of your family has been abused by medical personnel, contacting a knowledgeable elderly abuse attorney can help your family find the answers and justice you deserve. Is the Problem Poised to Get Worse? Back in 1996, a National Elder Abuse Incidence Study found that roughly 450,000 American elders faced some form of abuse nationwide. Now, that number has increased to as much as five million elder abuse cases each year. So why the increase? The clearest sign to point to would be the massive rise in the elderly population over the last two decades. According to census reports conducted in 2010, roughly 13% of the United States population was found to be over the age of 65. At the time, this represented the largest amount of people within that age demographic in American history. With the Baby Boomers generation rising in age, the number of elderly Americans will continue to increase significantly. In the decades down the road, the problem has a chance to continually increase in commonality. By 2050, estimates suggest that roughly 20% of all Americans will be older than 65. In all likelihood, the increase in elderly population will be accompanied by an increase in nursing home abuse. When caring for an elderly loved one becomes too difficult to handle, a long-term care facility may be the only option for a family. Unfortunately, nursing home and assisted-living facility staff members represent the largest demographic of elder abusers. So, what can you do to help ensure that your loved one will not face the same fate of countless senior citizens nationwide? The simplest answer is to stay engaged. Elderly patients who are infrequently visited by family members and face elongated periods of social isolation are often the easiest victims for abusers to target. By frequently visiting your elderly loved one, you can ensure they are socially engaged, happy, and healthy, while also gaining invaluable insight into the work of caretakers and other staff members. In the event that your loved one is facing abuse, frequent visitation provides you with the opportunity to recognize symptoms such as bruises, abrasions, or changes in behavior. Despite the best efforts of loving and supportive family members, many elderly Americans still fall victim to elder abuse. At Flaherty Law, we know how difficult elder abuse can be for a family to handle. 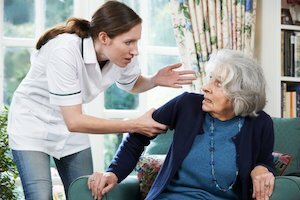 If your family is impacted by the tragedy of nursing home abuse, it is incredibly important to contact a knowledgeable Will County personal injury lawyer. To set up a free consultation, contact us today at 815-577-7500.